d: July 23rd, 1884 in Neuburg, Russia. Andreas Hirning was born between June 25 and July 5, 1804 in Auingen, a small village in Schwabische Alps between Stuttgart and Ulm Germany. In the summer of 1803, two Germans: Ziegler and Schurter, acting as agents for the Russian Government, were actively recruiting immigrants in Southwest Germany; while in Russia itself extensive preparations were under way for their reception and settlement. The Czar himself and his Minister of Interior, Count Kotchubey, took a very personal interest in the matter. Instructions were issued to the Governors and other Crown officials in the South regarding the reception that was to be accorded to the German immigrants, financial support that was to be given them the areas in which they were to be settled, and other pertinent details. Duc de Richelieu was given the task of buying up suitable agricultural land in the given areas of Odessa region. The Governor of Taurida was instructed to find land in the Crimea for the experienced wine-growers among the immigrants. Kontenius was to supervise the subdivision of the land, the establishment of the newcomers in their village sites, the distribution of support money, and the acquisition of livestock and farm implements. Facilities for the foreign settlers was still far from ready before the end of 1803 when eight transports of more than 200 families, well over 1,000 people led by Ziegler had arrived in Odessa. Andreas' family migrated in 1812; they were looking for a better life. Probably the most significant factor to the German migration came about when Napoleon Bonaparte ascended on the scene. During the early 1800's the Rhineland and German states of Southwest, were subjects of Napoleon. These districts were required to furnish men for his armies, give extensive financial support and required to quarter the French troops. In addition they were heavy taxes to be paid, together with inclement weather, made conditions so unbearable for the peasants that many were eager to leave for Russia. The journey to Russia in those days was an ordeal to try the strongest. The routes varied according to the area of origin. The hardship of journey and the first months in the new land were beyond the endurance of many. The journey by boat and wagon and often on foot, took from two to five months and often meant wintering on the way. Upon arriving at the border the immigrants had to face a quarantine period and then lived in primitive barracks for weeks or months before the settlement site was ready. The mortality rate reached shocking proportions. Many families were almost wiped out and few reached the settlement sites intact. But many still came. It is understood that Andreas and his parents and two uncles from his father's side made this trip. (There may have been more Hirning relatives that went with.) He lost both of his parents on the way. They were buried somewhere along the way. He continued the trip with his two uncles arriving in the village of Neuburg, which is known now as Novogradovka. 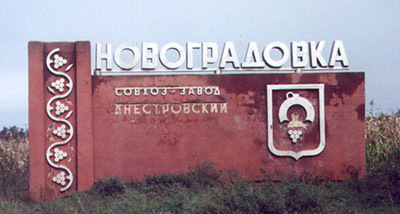 Click here for a modern picture of the village's sign. When they arrived in Russia and saw the horrible conditions there, some of the family returned to Germany, but Andreas decided to stay. The German immigrants came to Black Sea region by the thousands, mainly from Southwestern Germany, such as: Württemberg, Baden, the Palatinate, and the Hessian states and Alsace where the Napoleonic Wars had the greatest impact. Immigrants also came from Hungary and Poland, where Germans had settled earlier. In spite of many hardships of the early years; crop failure high mortality rate among children, sickness among animals, the Germans were relatively happy in their adopted land. During the first sixty years the settlers were well treated by the Russian government. Families were extremely large and thus living space in the colonies became scarce. The German were thrifty and were able to buy up land all over the countryside from Russian Nobles. Soon the Russians became jealous and pressure was brought to bear on the government to withdraw the special privileges which had been granted the settlers. Eventually the government complied with the wishes of Russian people and in the spring of 1871 the colonists were informed by the Ukase of the imperial government that their privileges were gone except for religious freedom. The colonists were astonished as to what had happened. Now they were required to give up their culture, language, and deliver their sons to the Russian army and to become Russians. Deep down in their hearts they knew that eventually they would have to surrender their religious freedom also. Andreas lived in Neuburg for the rest of his life. He first married a woman believed to be named Johanna Humann (?) but it is not known if there were any children from this marriage. After her death he married Eva Heinz. They had 4 sons and 5 daughters. The 1880s Grossliebental Death Records from the Odessa St. Petersburg Archives shows that Andreas died on July 23, 1884, at the age of eighty years and three days. According to the death records, it shows a Johannes who died Oct. 22, 1878 in Neuburg (aged 80 years and 6 months), whose wife was Margaretha Laufer; It also also shows a Christian who died April 15, 1879 in Alexanderhilf (aged 80 years and 4 months), whose wife was Margaretha Krauer. The death records indicate that the place of birth for each of these three Hirnings was Ulm, Germany. The relationship between these Hirnings and Andreas is not known, but it is likely his brothers or cousins. After the oppression began in Russia, many began to look elsewhere for a more stable life. They began to hear of a better life to be had in the United States. Thus began the great migration to the United States. If you have any information, additions, or corrections, please e-mail robert at hirning.org!